This is a prediction race, so participants may not wear watches. Leave ’em in your car, your gym bag or at home. The winner is the runner who runs closest to their predicted time. FSRC Grand Prix results will be based on actual finish time. How much: Free for Steeplechaser members, $10 for non-members. Pre-registration is available online and registration is available on-site race morning. But please preregister if you can to help save volunteer effort on race day. If you’re not a club member, you can join on race day for $20 to enjoy many other benefits throughout the year. Or better yet, join/renew online before race day. What else: The Lewis Run is our early season race that we love to hate. Prizes go to the closest predicted time and front runners receive our admiration and a hearty slap on the back. Course is paved but REALLY HILLY! Directions: From Rt. 40 (West Patrick Street in Frederick), turn onto Waverly Drive by the Frederick Town Mall. Follow speed bumps to Shookstown Road. Go left and begin to climb. Watch for Lakeview Drive on the left, but don’t turn on it. Make the next left onto Oakmont Drive (it’s hard to see). Go down a steep hill to a lake with a clubhouse on the left. That’s it! 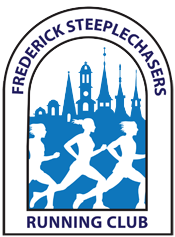 Any announcements about possible cancellations due to weather will be made on the Frederick Steeplechasers Facebook Group. Carpool if you can – parking can get tight.